Therapeutic laser, or cold laser, is a noninvasive therapy that uses light to stimulate cell regrowth and increase blood flow to certain areas. This helps to treat and manage arthritis, soft tissue and tendon injuries, and greatly helps in wound healing. It can be combined with surgical procedures to promote faster healing times or used independently to treat a wide variety of inflammatory processes. 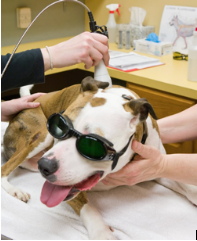 Ask us today how laser can help your pet today. © 2019 Cabarrus Animal Hospital.